Showcase your greeting cards with a snowflake holiday card display using Krylon® satin and metallic spray paint. Use a reciprocating saw to cut through the fasteners to release the wood from the pallet cross supports. This allows you to maximize the amount of usable wood for this card display project (optional: you can also use a circulating saw or a handsaw for this step). Using a tape measure and pencil, measure the pallet wood to 30 ½” tall. For a more rustic, barn-inspired look select pieces of the pallet wood that have nail holes and are more distressed. Arrange the wood side-by-side so the wood is 36 inches wide by 30 ½ inches tall. Cut all the pallet wood to the appropriate length. To create the snowflakes, cut several pallet wood pieces in half to creates several skinny long pieces, and then in thirds lengthwise. After having the skinnier boards, lay them out to create snowflake shapes. Cutting the boards into smaller shapes to create the patterns at the 6 points. The snowflake should have a flat front surface. Make 5 snowflakes, roughly 11 inches wide. Glue the snowflake pieces together and let dry completely. Now it is time for painting. In a well-ventilated area or outdoors, cover a flat surface with a drop cloth or tarp. Before starting, read and follow the safety and application instructions on the spray paint can. Lay the snowflakes on the tarp and spray several light coats of Krylon® ColorMaster Paint + Primer – 25% More in Satin Ivory and let dry. Optional, to help achieve an even top coat add a base layer of Krylon® ColorMaster Primer – 25% More White Primer before painting the Satin Ivory. To create added shine, tape off different patterns on each snowflake. Spray 2-3 light coats of Krylon® ColorMaster Paint + Primer Metallic – 25% More in Metallic Gold and Metallic Silver. Let the metallic paint dry to the touch before removing the painter’s tape. Line up the individual pallet boards strips on the tarp and spray paint them with 3-4 light coats of Krylon® ColorMaster Paint + Primer – 25% More in Satin Burgundy. Optional, to help achieve an even top coat add a base layer of Krylon® ColorMaster Primer – 25% More White Primer before painting the Satin Burgundy. After the paint is dry on all of the pallet boards, turn them over and lay down two crossbars at the top and bottom. Attach the pallet boards to the cross bar using a staple gun and staples. On a table place the pallet board Satin Burgundy side facing up. Arrange the snowflakes on the board. From the backside of the pallet board drill a hole through the center of the snowflake attach with a screw. The snowflakes should be snug to the board, but have a little bit of space to insert cards. 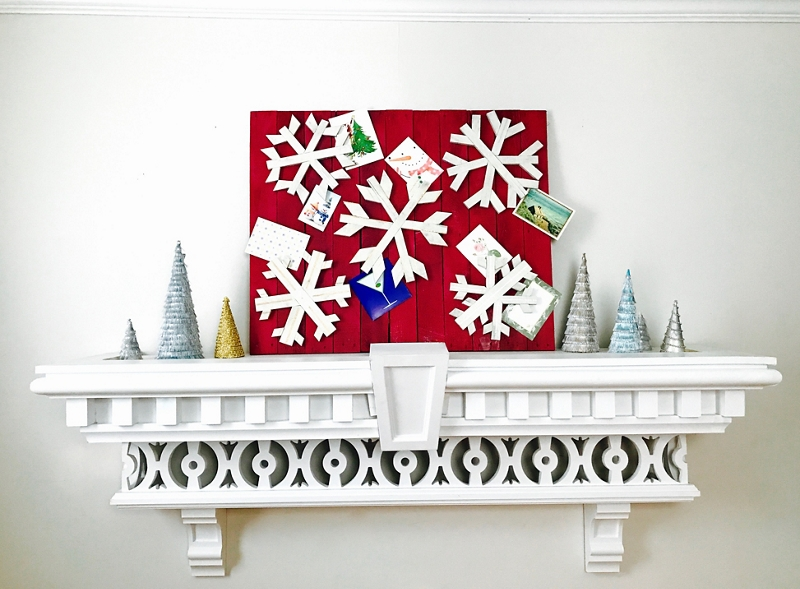 Add your greeting cards to each snowflake!